Those of you that need to measure larger spaces on a continual basis might be interested in a new smart laser measure which has been created by a team of developers based in California. The 3Dazer laser measure comes complete with its own companion smartphone application and is small enough to fit in your pocket, for easy transportation and availability when required. Forget the hassle and inefficiency of a tape measurer. Now you can easily take measurements and record the information for anytime, anywhere access and sharing. It’s also small and compact so you can conveniently carry it with you at all times in the soft pouch included. 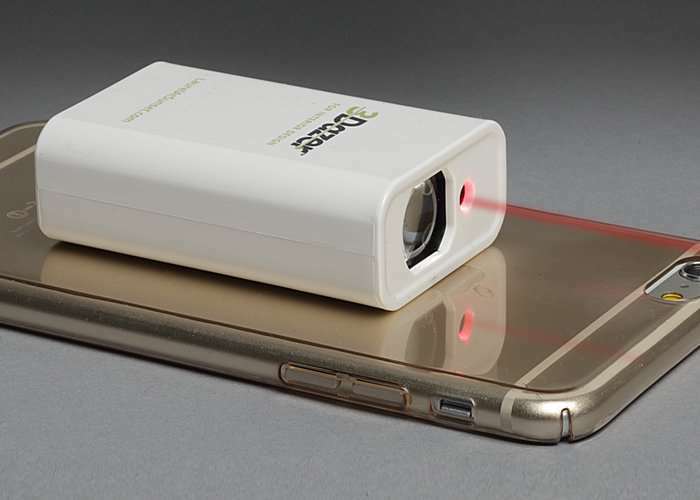 ios App and portable laser device with box contents: laser measurer, charging cord, carrying pouch and snap-on iPhone case. An advanced measuring solution with a patented laser device and mobile app that turns your iPhone into a smart laser measurer. Jump over to the official kick starter campaign page below for more details and to make a pledge. Although pledges available do seem a little restricted if the team are hoping to take their device into production.